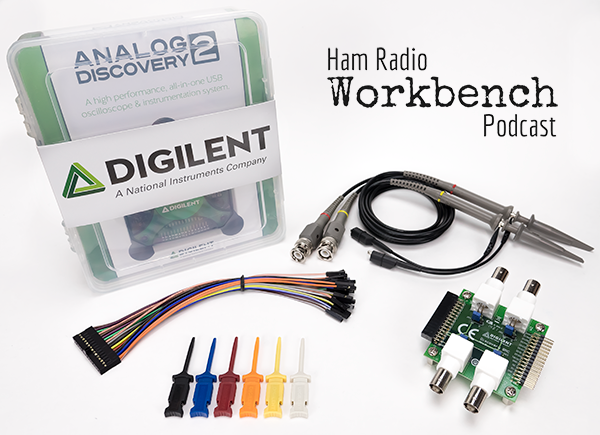 In the last few weeks the Analog Discovery 2 has been mentioned repeatedly on the Ham Radio Workbench podcast as the ideal workbench solution for the Ham Radio operator. Today I’m excited to announce the Ham Radio Workbench Bundle. 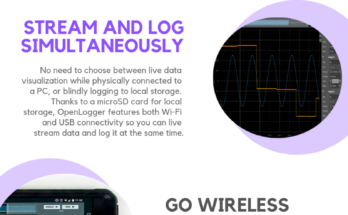 The bundle is made up of the Analog Discovery 2 and choice accessories selected by the Ham Radio Workbench Podcast hosts as the portable instrument of choice for amateur radio operators. 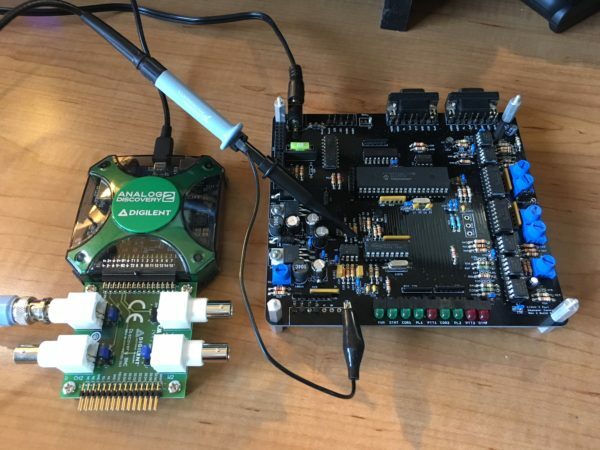 The accessories provide standard BNC connections, and the ability to easily grip soldered on components to create a portable work bench for the design and debugging of Ham Radio related projects and designs. This workbench build project is a two port repeater controller. The Analog Discovery 2 is used as a signal generator, oscilloscope, static switch controller and spectrum controller. Each port takes the receiver’s audio input and goes through several stages and eventually comes the other end to drive a transmitter’s audio input. Each audio chain consists of a receiver input buffer, optional pre-emphasis, audio mixer, DTMF decoder and output audio buffers. The signal generator is used to generate a reference 1 kHz tone and the scope is used to check the gain and distortion at each stage. Once the basic audio path is tested to be correct, the signal generator is used to generate a sweep form 0 to 4000 Hz to see what the frequency response is for the system. After the audio path has been checked out the static IO pins are used to drive the logic state inputs of the controller. In this application the COR and PL logic input for both channels are manually controlled with the static IO control panel and the PTT and Fan control outputs are monitored by the virtual LEDs on the station IO panel. 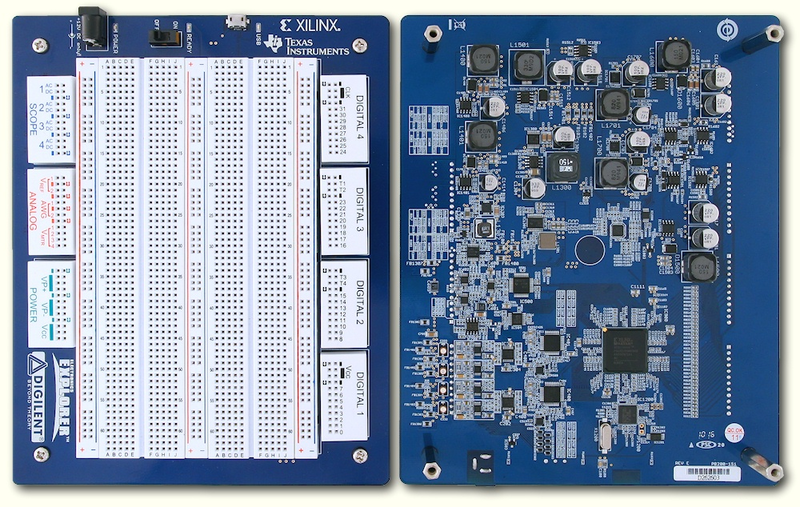 Ultimately the system stress test can be programmed into the Analog Discovery 2 to perform all tests in sequence to be able to test multiple boards. An important reminder, Digilent is currently under a planned closure. 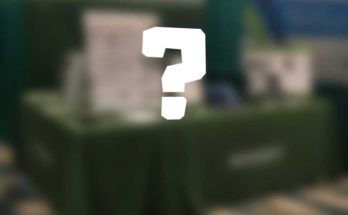 This means that you can place an order, talk to customer service about your order, and get technical support on the Digilent Forum, but you will see delays in shipping. For more information, check out this blog post on our planned closures. For more information on the bundle check out its store page, and for more information on the Analog Discovery head to AnalogDiscovery.com. Previous Article Arty Party- Get a Look at our Arty Line-Up!